Port of Cape Town, Table Bay, the Fairest Cape, the Cape of Storms, the Cape of Good Hope, the Mother City. All these names provide an idea of what to expect. Cape Town competes with Alexandria for recognition as the most famous port in Africa and is certainly one of the most beautiful harbours in the world with a magnificent backdrop of Table Mountain framed by the mountainous Peninsular and the vast hinterland of Africa beyond the mountain. The port is situated on one of the world’s busiest trade routes and will always retain strategic and economic importance for that reason alone. Cape Town is also a busy container port, second in South Africa only to Durban in terms of ship numbers, and handles the largest amount of fresh fruit. Fishing has a significant place in the economic activity of the port, affecting the ship repair industry in particular, with large Asian fishing fleets using Cape Town as a transhipment logistics and repair base for much of the year. The emerging oil industry in West Africa has also become a significant factor for the port’s repair and maintenance facilities. 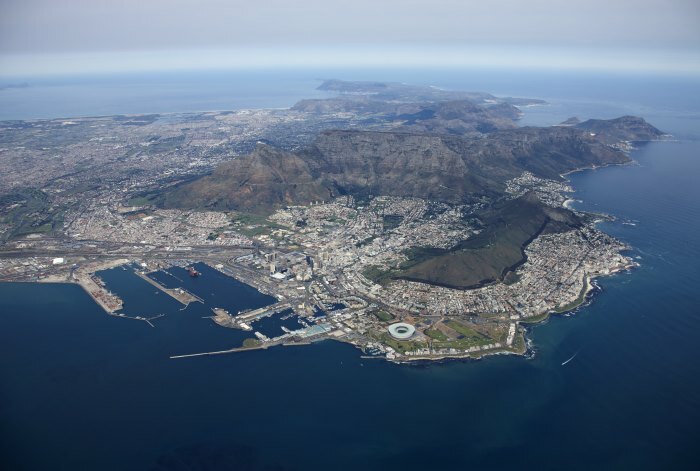 ‘The Fairest Cape’ is a key destination for cruise ships, particularly those engaged in round the world cruising, and provides excellent direct airline connections to most parts of the world for passengers arriving or departing from their cruise. Many of the smaller and medium size passenger ships no longer make use of the world famous V&A Waterfront with its added tourist attraction and ambience and have joined the larger ships which go into the main harbour together with its tight security. Plans are afoot however to develop a new passenger terminal at Cape Town in a site adjacent to and within easy access of the waterfront for passengers and visitors. The port remains open 24 hours a day, seven days a week, but can be subject to strong winds that interfere with cargo and ship handling, in particular the infamous ‘Cape Doctor’, the South-Easterly gale. 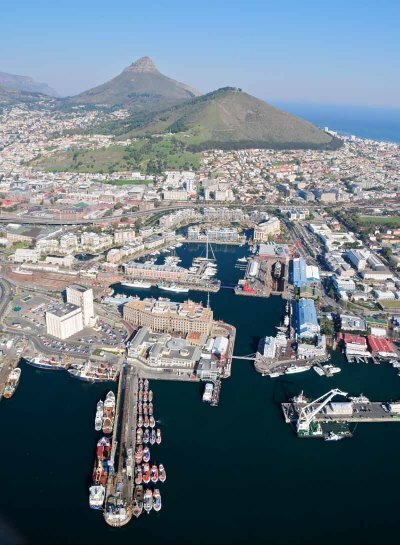 An increasing number of oil supply and support vessels and rigs use Cape Town for repairs and refurbishment and the ship repair industry is vibrant and healthy, with A Berth in use as a dedicated ship repair quay. The port is situated in Table Bay at Longitude 18º 26′ E and Latitude 33º 54′ S and lies 120 n.miles northwest of Cape Agulhas (the most southerly point in Africa). 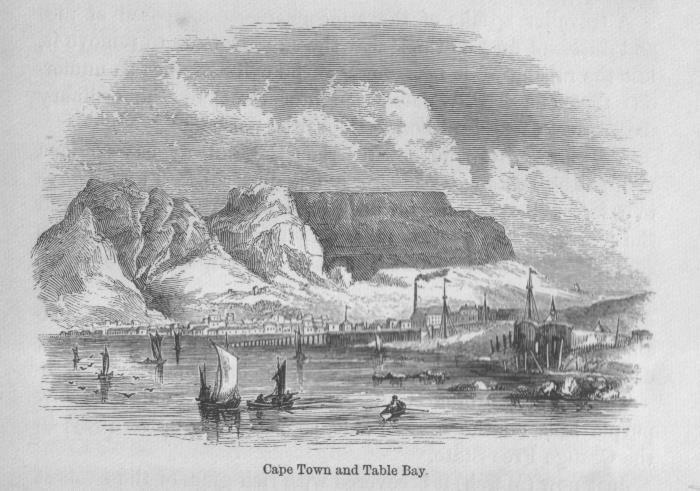 Cape Town was established by the Dutch on 6 April 1652 when Jan van Riebeeck arrived in Table Bay to establish a victualing station for ships of the Dutch East India Company (VOC) on their long voyages to and from the Dutch East Indies. 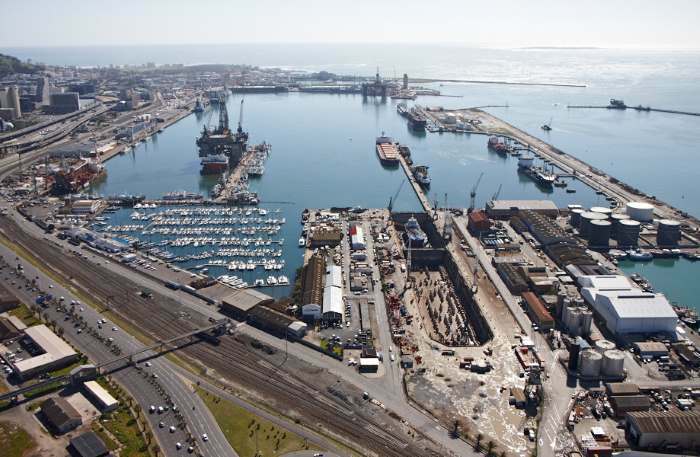 The port progressed steadily over the centuries and consists today of two ‘docks’ – the outer Ben Schoeman Dock in which lies the container terminal, and the older inner Duncan Dock containing the multi-purpose and fruit terminals as well as a dry dock, repair quay and tanker basin. Cape Town also boasts an extensive yachting marina. 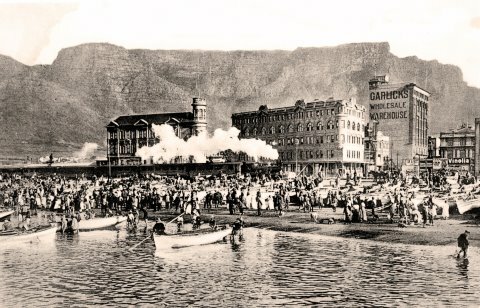 The historic Victoria and Alfred Basins – the original Cape Town harbour – now house the world famous Cape Town Waterfront but remain in use for commercial purposes, creating a unique attraction for the waterfront development. These are used by smaller commercial vessels including fishing and pleasure boats but a variety of interesting research and Antarctic supply ships make use of the V&A. 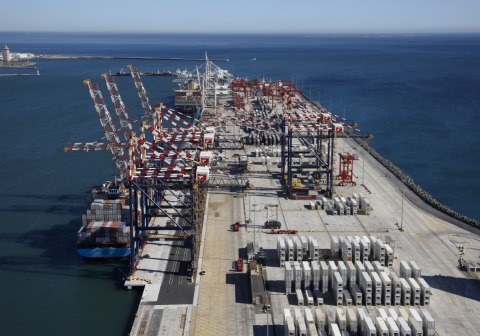 The port of Cape Town remains open 24 hours a day 7 days a week. The depth at the entrance channel is -15.9m Chart datum, is -15.4m at the 180m wide entrance into Duncan Dock and -14m at the entrance to Ben Schoeman Dock. The depth in the Duncan Dock varies between -9.9m near the repair quay to -12.4m at the tanker basin. Ben Schoeman Dock varies from -9m to -13.9m. Dredging is carried out regularly to maintain required depths alongside and in the harbour. Pilotage is compulsory for all vessels with the pilot being taken on board 1.6 miles and 155º off the main breakwater. Pilot transfer is by pilot boat. Navigation is subject to VTS (vessel tracking system) and tug service is provided by four tugs. The harbour and Table Bay are subject to strong winds during the Cape winter (April to September) that can disrupt cargo and ship working in the port. Cape Town operates a fleet of four Voith Schneider tugs. They include 1980-built 43t bollard pull tugs PINOTAGE (ex Paul Sauer) and MERLOT (ex Lourens Muller) and two 2001-built former Durban 50t bollard pull tractor tugs, ENSELENI and PALMIET. Each tug is maintained to SAMSA class 8 standard and is equipped for fire fighting and salvage. The port also employs two workboats named Kestrel and Blue Jay, two Damen-built pilot boats Red Bishop and Plover, four launches named Troupant, Koester, Kite and Weaver, a pollution boat named Pelican plus a heavylift floating crane Inkunzi. Total cargo handled at the port (excluding containers) was 4.226 million tonnes (4,720,185 tonnes in 2015), the majority of this being bulk cargoes. These figures exclude container tonnage, which is calculated as being 12.509 million tonnes for 2016 (12.001 mt for 2015). These figures are calculated on the basis of an average 13.5t per TEU giving the port a total tonnage handled of 16.735mt for the year (16.721mt for 2015), a small increase year on year. Cape Town’s Container Terminal handled a total of 926,611 TEUs in 2016 during the calendar year 2016 (888,976 TEUs in 2015), a reasonable increase on the previous year when other South African ports were either barely holding position or shrank their volumes. 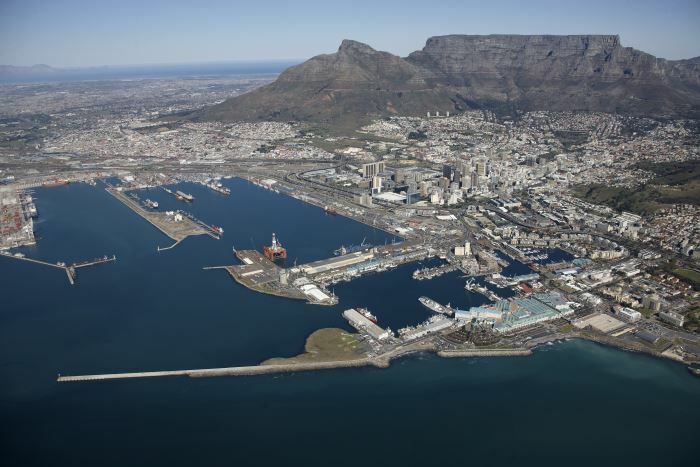 Cape Town, as the ‘Tavern of the Seas’ caters for general cargo on a common user basis, and is handling an increasing number of containers and in addition has become an important repair facility, especially for the west coast oil and diamond mining industries. The port boasts extensive ship repair facilities. The main dry dock, known as Sturrock Dry Dock has an overall docking capability of 369.6m length and is 45.1m width at the entrance top with a depth of 14m. The dock may be divided into two sections of varying lengths although the dividing inner caisson was in March 2017 requiring repair and therefore unavailable. The port also has a synchrolift capable of handling ships up to 61m in length, 15m beam and 1,806 tonnes, as well as a repair quay situated in the Duncan Dock. Berth A near the harbour entrance is given over to ship repair by private enterprise. The adjacent Victoria and Alfred Basins have a variety of berths available for ship and boat repair as well as berthing of smaller vessels, including research vessels and visiting naval ships. Cape Town has two main terminals, or business units for cargo handling purposes. The Container Terminal contains six deep-sea berths. They are served by a fleet of post-panamax gantry cranes for the larger container ships now in service. The Multi-Purpose Terminal in Duncan Dock handles fruit, steel, paper, maize, wheat, rice, timber, coal, scrap and other general cargo, as well as passenger cruise ships. Cape Town has a number of bunkering points within the port supplying marine fuel oil, gas oil and blends and the port is serviced by a bunker barge. A full range of ship chandling and stevedoring is available. The port, which is situated close to the central business district, houses a yacht club and marina as well as a NSRI sea rescue base.